Haha, I have purchased an iPhone apps : body symbol for months, yet I’ve never used it. Then after a very long vacuum time interval, finally I’ve used it yesterday. I was hanging out with my old friends : yoel & cindy on Solo Paragon, one of the latest mall in Solo. I stopped by at Calais, bubble tea shop. I was enjoying chocholate milk tea with lechy popping pearls, then chatting a lot there. A very cozy place to held a little reunion I think. In that moment we created that crazy idea : shooting on body symbol. Well, that was so exhausting actually. 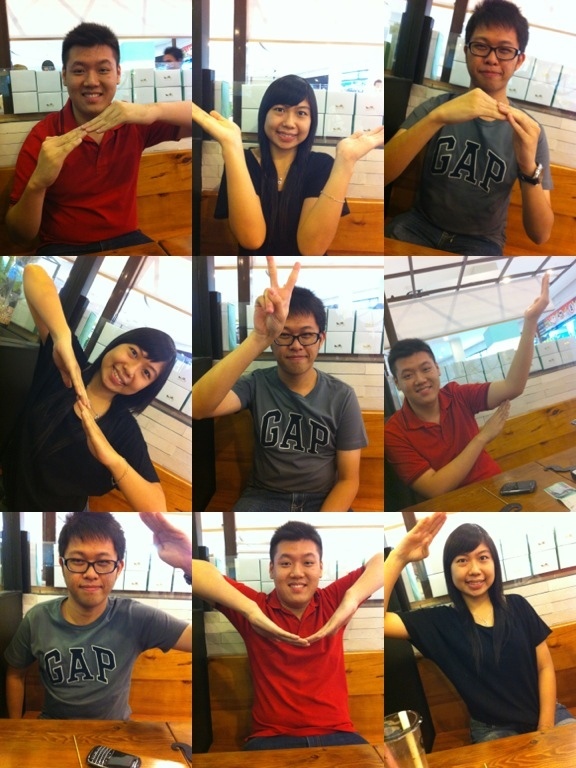 We just need 9 pictures to make a love sign by our hands, however we made hundreds shots there. Retaking the photo, editing the lighting, placing our arms in the proper position. However, those things were done in fun, full of laugh and excitement. 😀 well then I just want to share the result of our struggling. Not so good, but it can bring us joy and sweet memory. Commit my Plan or Commit my Doing? This verse of Solomon’s proverb played a role in my last life ‘project’. I joined PMK (Persekutuan Mahasiswa Kristen) ITB. It is a kind of a fellowship of ITB Christian Students. In the last early August, there was an initiation program for the ITB freshmen. PMK was also involved in the program in order to welcome the christian freshmen. We name the program PMB (Penyambutan Mahasiswa Baru). I joined PMB commitee as the coordinator of Mentoring Division. In my opinion, this is the most complex and the hardest commitee I’ve ever joined. I met many struggle & bitterness. That was so awful. I can not tell every detail of those things. But one thing that I’ve learnt : in every single simple stuff, I have to commit them to my LORD. This is how He may establish my plans. At first, I thought that the verse was ridiculous. I argued that the verse will be better and powerful if it said : “Commit to the Lord whatever you plan, and He will establish your doings.” That was what I did. I had so many plans, yet so many failures. So many great plans ended with epic disasters. In my dissapointment, I found that the verse don’t work well in my mind. However, I was rethinking and reinterpretating those word. I found that it might be that the word was not powerless nor ridiculous. My way of thinking was. I made many plans by my own understanding. My plans were based on my own observation, my own wisdom, and my own knowledge. After that, I came to God, praying that all my plans should be perfect, that God keep my plans well. God is my plans-guard, someone who can assure me about the realization of the plans. What a pity, that was absolutely mistaken. King Solomon said that I should commit my doings, not my plans. Everything I’ve done, both I’ve planned before and I’ve never planned. I should seek God first before I make any plan. I should know what was His Will for my problem. What He want me to do, and what He want me not to do, then I might made any plan after that. That is why I was so depressed when my plan was not done well, because my knowledge was too litle to handle any possibilities. I should commit everything first to the LORD, then His plan would be nice for me.